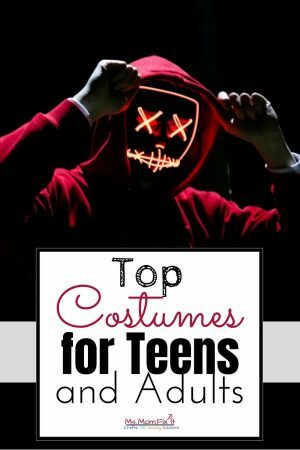 Teens and adults have some great Halloween Costumes choices based on trends for 2017. Costumes often seem to revolve around the latest movies, popular TV shows, and hottest social trends. This post will dive into the top choices for purchasing a ready-made costume. If you tend to be creative, you may want to check out this post which features DIY costumes. Let’s start with some of our favorite popular characters! Pennywise was the creepy, killer clown that haunted and terrified children in Stephen King’s novel, It. The latest film version was just released. Pennywise has received an updated appearance although his look is now a bit more old-fashioned. 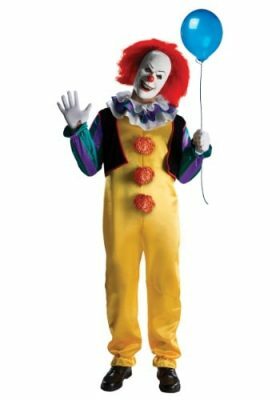 Pennywise costumes are available for both the latest incarnation of the previous version. Many of the original costumes are a basic jumpsuit in yellow with 3 pompoms down the front. Some costumes will include a vest in bright collars and a large collar with several ruffles. The 2017 Pennywise costume is a gray shirt with white puffy sleeves, red pompom buttons down the front, and a collar. Game of Thrones is one of the most popular television series this year. It’s an adaptation of a George R.R. Martin’s series of medieval fiction books. It focuses on the power struggle between various families within a kingdom. This show has popularized costumes since 2013 based on recognizable characters that are beloved and even hated. Two of the most popular characters in the show are Jon Snow, Commander of the Night’s Watch, and Daenerys Targaryen, the Mother of Dragons. 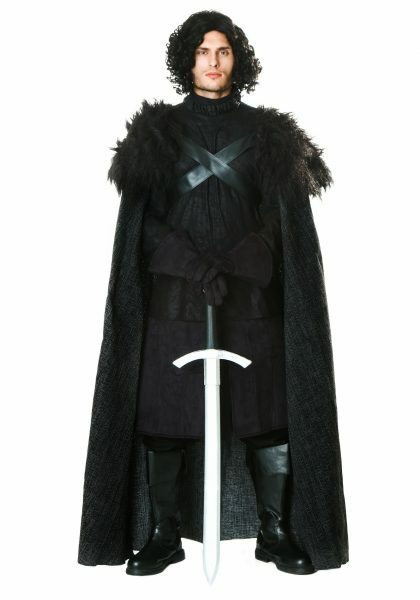 Jon Snow’s outfit is fairly easily recognized as he wears a black tunic with a dark-furred cape, keeping him warm in the harsh northern cold. The character has short, curly black, neck-length hair. You will be able to find wigs that resemble his haircut very closely. You may want to complete his outfit by adding some black boots and possibly a sword (which he uses very often). You can also recreate his facial battle scars using fake scars. Daenerys is even more recognizable than Jon Snow due to her very light blonde hair which is almost white. Costume websites have a plethora of wigs that get the color and style almost exact. For the main part of your Daenerys costume, you’ll need her blue tunic, cape, tan pants, and brown boots. The Walking Dead is sure to be in the top costumes again this year especially with the season premiere taking place in October. This is one show that’s thrilled countless fans and kept them on the edge of their seats. For those of you who are unaware, the show is based on a zombie apocalypse with Rick Grimes as the hero fighting to save the people that he cares about whilst trying to stay alive himself. If you are a fan of the show, you will notice each season the zombies (Walkers) become more “authentic” looking. The Walking Dead costumes are a great alternative as you can use a lot of your personal items to recreate the appearance of both the heroes or the Walkers. Groups that want to dress alike can easily each pick a different character to portray. to go as a group featuring favorite characters from the show or even some of the villains or the Walkers. The Rick Grimes costume is usually based on his law enforcement uniform that he wore when the show first started airing. So you will need a tan shirt with functional pockets, brown pants with belt loops and accessory belt. To complete the ensemble, you will need a law enforcement badge and his sheriff’s hat. Negan, who was introduced last season, is one of the most hated villains on the show. Negan sports a leather jacket and Lucille, a baseball bat with the barbed wire wrapped around it. Going back to heroes, one of the top fan favorites on the show is Daryl Dixon. You can find a few options for Daryl. 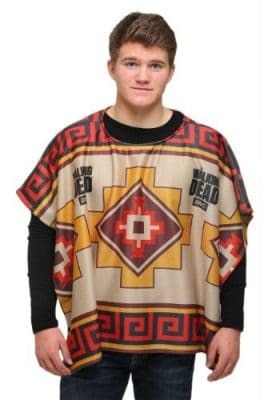 One option is a large poncho with a print design. You can also find his signature biker’s vest with Angel wings on the back. Of course, Daryl’s signature weapon of choice is his famous crossbow that he uses to vanquish plenty of Walkers. Doctor Who is a popular BBC series that began in 1963 and ended in 1989. The series reboot began in 2005 and is still just as popular today as the original release. The main character has been played by several different actors, and each gave life to the character in his own way. Each portrayal of the character has brought a quirkiness and unique style that fans love. The costumes will vary in both design and style for men or women because of the numerous different Doctors. If you want to find a costume based on this character, you can usually find them by the doctor numbers. For example, the first Doctor Who differs from the twelfth Doctor Who in costume. The 11th Doctor Who’s costume is a tweed jacket along with the signature red bowtie. This costume is usually a button up with usable pockets inside and outside. The costume for the 10th Doctor Who is a long double breasted trench coat with flap pockets and buttons. 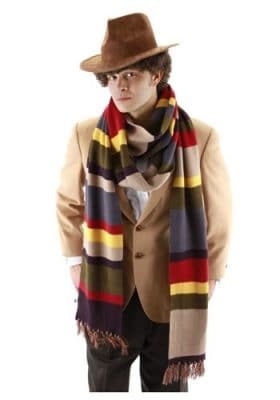 The 4th Doctor Who is still a fan favorite sporting an extra long knitted scarf. The 12th Doctor Who has a modern elegant jacket sporting secret compartments (like the TARDIS) which can hold all of the Doctor’s most important tools. Don’t forget your sonic screwdriver! Several of the incarnations are available for women and teen girls. The Dalek is an antagonist alien cyborg who fights to defeat the Doctor. The Dalek costume for women is usually a bronze dress designed to look like a shell. 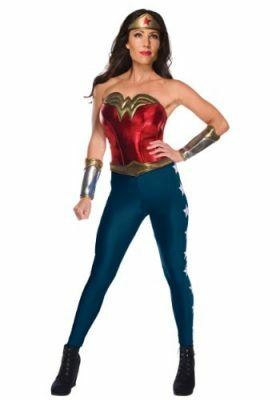 Naturally, many young girls want to dress up like this iconic comic book heroine! Wonder Woman was one of the most popular movies of 2017 for both critics and audiences. The release of the movie brought an updated look to the classic costume while keeping many of the traditional elements. There are very modest costume choices for girls and tweens and there are more daring choices for adults. 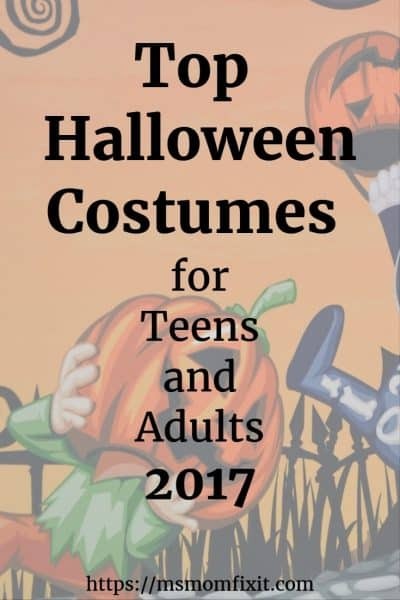 many options for costumes – ranging from very modest ones for kids up through more daring ones for adults. One of the most important parts of any Wonder Woman costume is her tiara. It’s one of her most iconic parts of her outfit, and it’s been on every version of her. Of course, her metal gauntlets and tall, red boots are also important. While Wonder woman’s clothing has varied throughout the years, it consistently features a red upper corset and blue bottom. If you prefer to be modest, you can get a classic long blue skirt with white stars (reminiscent of the American flag). If the weather is a concern, you can also get leggings to match instead. There are many different styles to pick from to suit your interests. If you prefer a more modest costume, you can get one with a classic long blue skirt with white stars, reminiscent of the American flag. Of course, you might want to add some accessories to really pull the whole costume together. You could get Wonder Woman’s iconic golden Lasso or replicas of the sword and shield used in the 2017 film. Teens and adults can easily find the Gru costume which looks exactly like the one you see onscreen. Steve Carell plays the lovable criminal mastermind Gru. While Gru is a hilarious criminal, he has an obvious soft side. With different manufacturers, you may find some minor variances in the costume design. One of the key features though is the latex mask. While not every costume will include the mask, you really do need it if you’re going to pose as this criminal mastermind. This mask is rounded (similar to an apple shape) just like the character’s face. It also has long eyebrows that resemble an arching frown. Gru has wide eyes and long, narrow, beak-shaped nose. The mask also portrays his signature smirking smile. 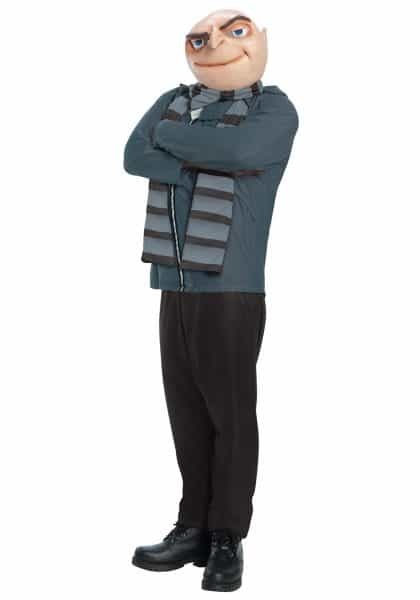 The Gru costume features a long-sleeved gray shirt and dark pants. He also wears a striped scarf although shoes are not part of the costume. This is just a sampling of the great store-bought costume selection available for Halloween 2017. I know you will love some of the choices featured in this article. Again, if you are more of a do-it-yourself fan, please check out this post.